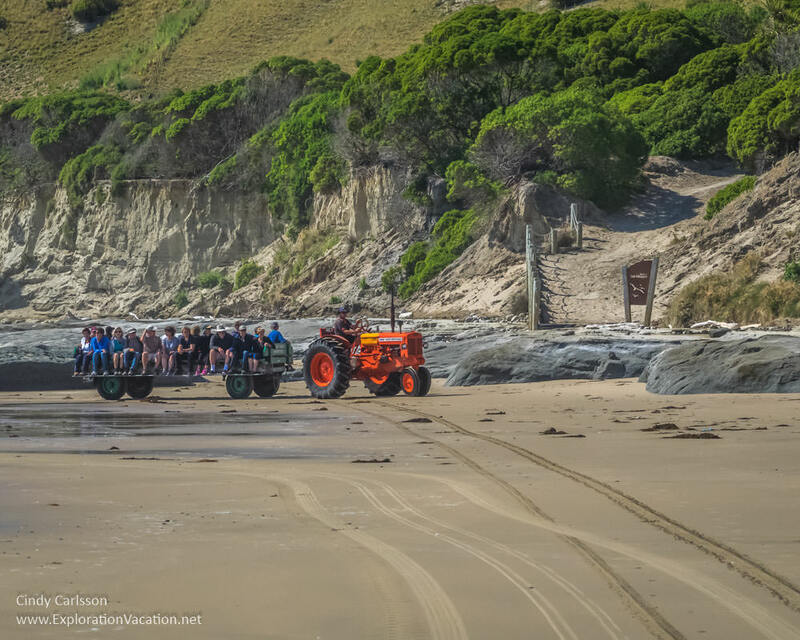 Dramatic coastal scenery, the world’s largest mainland colony of Australasian gannets, and the opportunity to take it all in via vintage farm tractors – a Cape Kidnappers tractor tour is a great way to spend a day in Hawkes Bay, New Zealand. 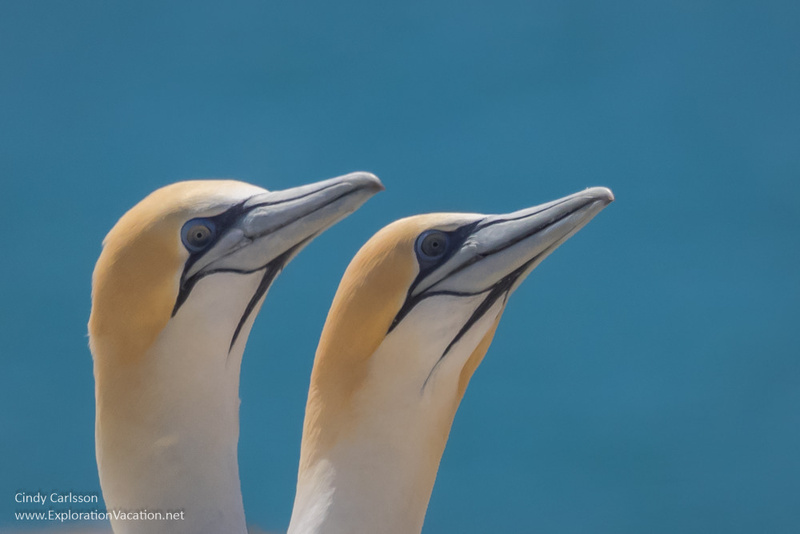 Gannets are lovely birds, with gleaming white bodies, golden heads, and blue eyelids! They are also largely sea-dwelling birds and, as such, often nest in places not easily reached by humans. However, New Zealand’s Cape Kidnappers gannet colony is not only the world’s largest mainland colony, but also one of the easiest to visit. The 12 mile hike along the beach to see the birds on their nests and back again makes a lovely half-day trip for fit hikers. 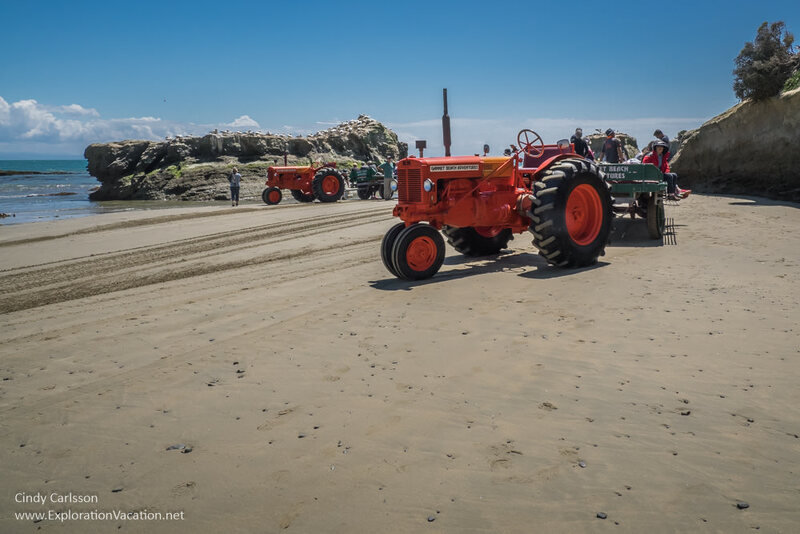 For the rest of us, Gannet Beach Adventures offers a trip along the beach on wagons pulled by vintage Minneapolis Moline tractors. The day we visit, two 1949 tractors are in use. Each hauls two wagon loads of tourists along the beach to the gannet colony. Along the way, we see beautiful scenery and get quick lessons in geology, natural history, and more. The tour begins with gorgeous scenery and a bit of geology. 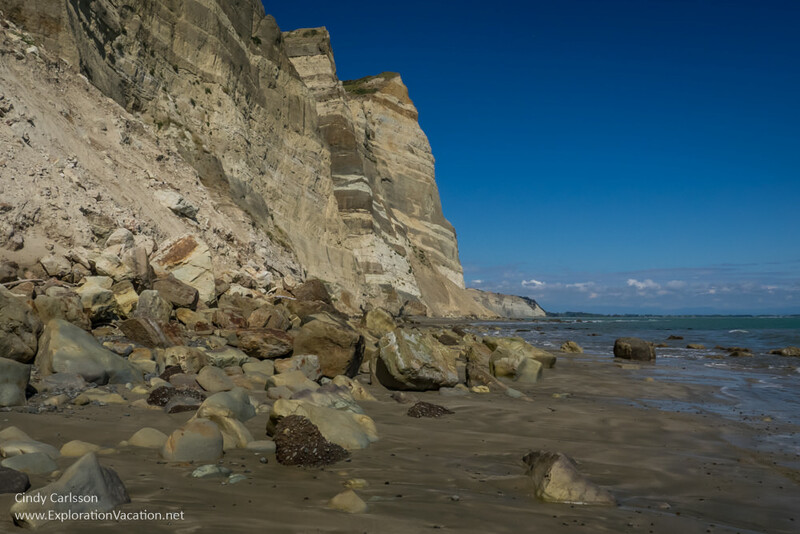 The beach at Cape Kidnappers is framed by cliffs that reveal four million years of earth’s history. As we travel, we stop to more closely examine the changing layers in the cliffs, the fault lines that show the earth’s continuing movement, and various types of rock. We learn that these towering cliffs are basically dried mud and the rocks we bounce over a form of peat! The farther the tractor tour takes us along the beach, the more birds we see. Not just the red-billed gulls (Tarapunga) that boldly challenge our intrusion, but also gleaming black oystercatchers (Toreapango) and others I fail to identify as they quickly swoop past. We also stop to observe white-fronted terns (Tara). They are nesting on a lower cliff just above our heads as we watch them from the wagons. Only a couple of fuzzy chicks are visible, but they already look almost as big as their parents! There is also a small colony of Australasian gannets (Takapu) nesting in the boulders above the beach. This is the Black Reef gannet colony and, while fairly small, it is also easy to observe. Just past the Black Reef colony, the beach becomes broad and sandy, with rocky ridges (probably more of that peat) running through it. This is my favorite area, because it has an interesting mix of sand and rock and sweeping views back down the beach. It’s also one of the few places where we have a chance to get off the wagons and wander on the beach a bit. But not much of a chance if we still want time to see the main attraction: the large gannet colony on the headland high above us. The end of the beach where the gannets nest is part of the Department of Conservation (DOC) Cape Kidnappers Reserve. The headland itself is further protected by the privately owned and managed Cape Sanctuary. The tractors can’t go up to the gannet colony. Instead they swing around and let us off on the beach at the entrance to the reserve where the colony is located. As we disembark on the beach, all I can see ahead is a very large hill to climb. However, our guide cheerfully assures us it’s only a 25 minute hike to the colony. I’m sure that is true for some people, but not for me. It’s a hot, steep hike just to the small rest area! Luckily, the views back down to the beach are pretty stunning. But from there it is a much longer hike up hill to the gannet colony. It’s a long enough hike that I consider turning back again and again. But I keep going, fueled by the views, the promise of thousands of birds, and the idea that the cows grazing nearby are secretly laughing at me! And at last I reach the top of the hill and the gannet colony. The Plateau colony of Australasian gannets is home to up to 6,500 pairs and their chicks. You hear them before you see them, as gannets live packed together in what appears to be noisy chaos. There are birds on nests, birds wandering around, and birds flying in and out. It’s a noisy mass of birds. Gannets are social. They also like to converse with their mates as part of a noisy dance. While nesting is well under way in mid-November, it’s still a little early for chicks. In all the birds we can easily see, we only find one chick – and that one is too small to leave the nest. There is a lot of commotion, but I love watching these beautiful birds and could easily spend more time here. However, the tide – and the tractors – won’t let me linger too long. Time to head back down the hill to the beach. Back on the beach we have a few minutes to explore before boarding the wagons for the return trip. I am on the sea side this time, so I have good views of the stony beach and incoming tide. This time we make longer stops at both the Black Reef gannet colony and the cliff with the white-fronted terns. But our guides are conscious of the incoming tide and the need to find a path around the rocks and rising water in order to exit the beach. Back on the wagons we pass returning hikers as the tractors rumble determinedly down the beach like horses to the barn. And then our gannet beach tour is over. Cape Kidnappers is located on the east coast of New Zealand’s North Island and forms the southern end of Hawke’s Bay. It is named for a 1769 incident when local Maori attempted to “rescue” the son of Captain Cook’s Tahitian interpreter from the Endeavour. Cook’s crew immediately sprang into action, retrieving the kidnapped boy and killing a few Maori in the process. 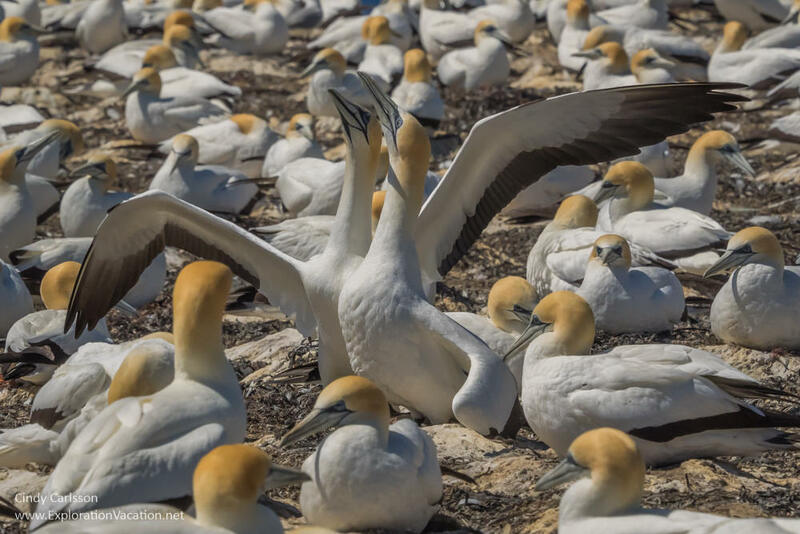 Today the cape is home to the world’s largest mainland gannet colony, a wildlife reserve, working farms, a spectacular golf retreat, and a dramatic beach. It’s also in the Hawke’s Bay wine region, making it a great place to linger for a day or two! Cape Kidnappers is an easy, scenic drive through the Hawkes Bay wine region from either Napier or Hastings. Access to the beach is located in Clifton, a small seaside community along Hawkes Bay that seems to consist largely of beachside cabins, trailers, and campers. Gannet Beach Adventures is also located right as you enter Clifton, just before you reach the beach. Whatever the season, the beach along Cape Kidnappers is only accessible at low tide. This means the tide determines what time of day you can visit. If you are visiting on your own, check a tide table and give yourself plenty of time to get off the beach before high tide. The beach is open throughout the year. However, the gannets are not here all year. 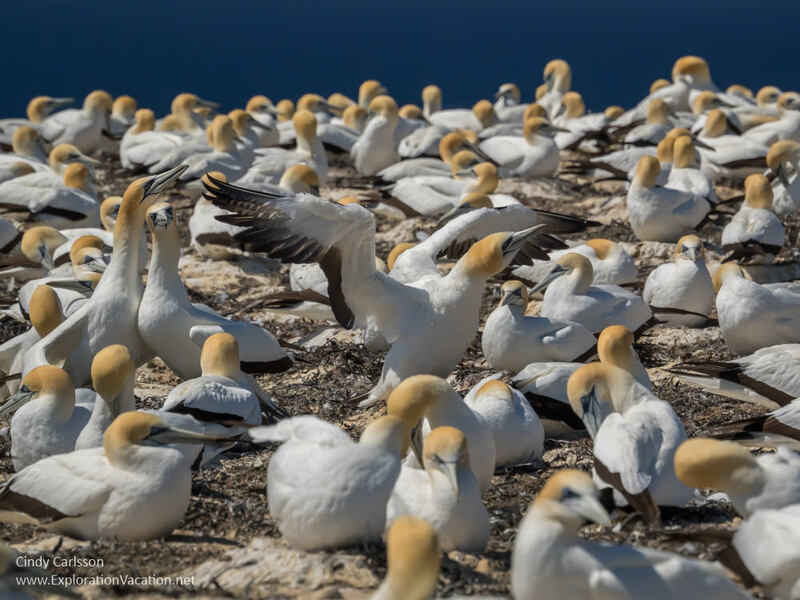 The Plateau gannet colony can be visited between October and June, although most gannets will be gone by the end of that period. The best time to view the colony is from November through February. Chicks generally begin to hatch in early November. The last chicks begin their journey to Australia in May. Once the chicks have migrated, the adults spend most of their time at sea for a few months until they are ready to nest again. Gannet Beach Adventures runs tours once a day at low tide from late September/early October through April. While anyone is free to hike or drive along the beach (beaches are public roads in New Zealand), tours provide both transportation and information about the area and its wildlife. In business since 1952, Gannet Beach Adventures transports visitors along the beach to the foot of the reserve where the largest gannet colony is located. Visitors ride in custom wagons towed by vintage American farm tractors. Stops along the way provide information on the area’s history, geology, and bird life – with plenty of opportunities to take photos of the area’s dramatic landscape. The tractors move along at a nice pace for viewing (and photographing) the scenery, although the rocky beach can lead to a bumpy ride at times. However, the wagons are far more comfortable than I expected, with padded seats, solid foot rests, and sturdy grab bars. The height also makes the wagons a great viewing platform and usually keeps everyone’s feet above incoming waves. Because there are stops along the way, the Gannet Beach tractor tour takes about the same amount of time as hiking the beach. Gannet Beach Adventures is the only Department of Conservation approved tour operator on the beach. All tours must be booked in advance. Check the Gannet Beach Adventures website for more information, including tour times (they change each day with the tide) and booking information. 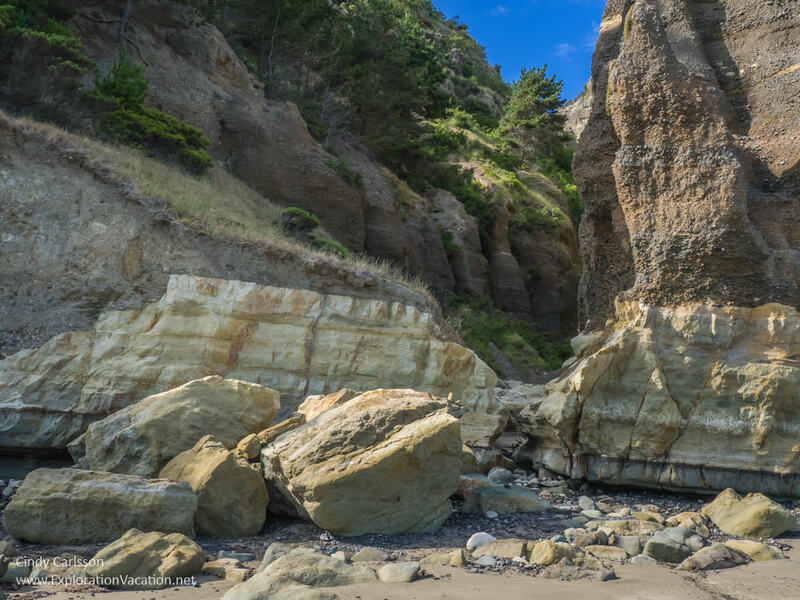 Although tours operate in all sorts of weather, Gannet Beach Adventures occasionally cancels a tour due to storms, rock slides, or other factors that make the beach either unsafe or impassable. Be sure to check the website the day before your tour for last-minute updates. There is no protection from the sun or rain on this tour either, so be prepared to spend a half-day outside. We loved our tour with Gannet Beach Adventures, and this is my recommendation for most people because you get to see this beautiful beach as you travel to the gannet colony. However, it does NOT take visitors up the hill to the large Plateau colony. (A significant uphill climb is necessary to see that colony.) 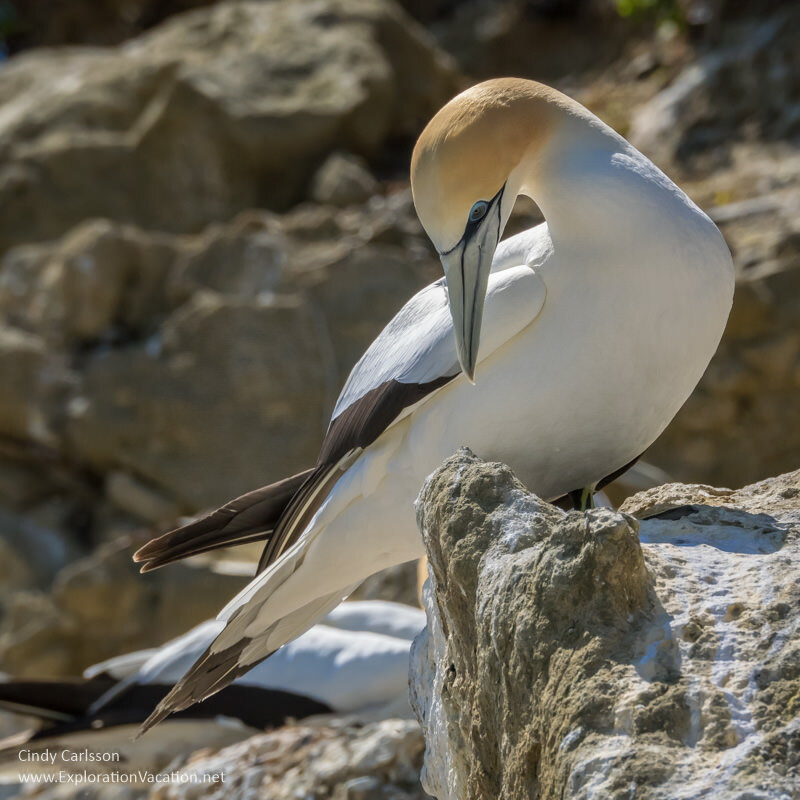 Visitors who can’t make the climb will see gannets only at the small Black Reef colony along the beach. The other tour option is Gannet Safaris Overland. This company (which I have not tried) uses vans to shuttle visitors to the Plateau colony through Cape Kidnappers Station. The tour includes stops in a native New Zealand forest, the predator-proof reserve, and a large working farm. The van drops visitors off just a few feet from the gannet colony, which limits both the amount of walking necessary and the amount of time spent in the elements. However, it does not include a tour of the beach. Gannet Safaris also offers private custom tours, which would allow serious bird watchers more time to observe the birds. This is ideal for anyone with limited mobility who really wants to see the large Plateau gannet colony. Both tours allow about the same amount of time to visit the colony. Hikers should plan for a five-hour round trip, which can only be undertaken at low tide. To ensure there is adequate beach to hike along, hikers should begin their hike no sooner than three hours after high tide and should depart no later than an hour and a half after low tide. While ATVs, motorbikes, and other motor vehicles are allowed on the beach, loud noise disturbs both birds and human visitors. The beach is only accessible at low tide and some sections are very rocky, while others are very soft. If you venture out in a motor vehicle, know what you are doing and be courteous to both wildlife and other human visitors. Motor vehicles are prohibited in the actual reserve where the Plateau gannet colony is located. There is no charge to visit the beach or the reserve where the Plateau gannet colony is located. Under New Zealand law, the beach is a public roadway. However, this area is home to a variety of nesting birds, and birds don’t like to be disturbed. Limit loud noises and fast movements to avoid disturbing the birds and other visitors. Keep behind barriers or at least five yards from nesting birds. Neither dogs nor horses are allowed on the beach or in the reserve. Fires and camping are prohibited on the beach and in the reserve. Don’t leave litter or garbage! Not only is it unsightly, but it can be dangerous to the birds who make their home at Cape Kidnappers. Do not rest or picnic along the cliff, as falling rock and small landslides occur frequently. The Plateau colony is located on private land. Motorbikes and other vehicles are prohibited in the reserve at the end of the beach. Besides the above warnings, visitors to the Plateau colony should stick to paths, avoid disturbing stock, and close any gates they open. The New Zealand parks and recreation web site has good information on visiting the Cape Kidnappers Gannet Reserve. There is no place to buy anything, including food and water, once you are on the beach. The Clifton Café is located directly across from Gannet Beach Adventures. However, it doesn’t open until 9:00 am. After 9:00, the café serves breakfast and lunch. Although the website describes “beach front dining,” the café I saw was in a grassy field up the road from the beach, not right along the beach. By lunch time a number of options are available at wineries along Hawkes Bay. (A few serve dinner as well.) We had a spectacular lunch at Elephant Hill and I highly recommend it if you are looking for a slightly more up-scale option before or after your tour. If you are looking to spend the night at Cape Kidnappers, the options are limited. The only way to stay right along the beach at Cape Kidnappers is to book a basic cabin at the Clifton Motor Camp. Tents, caravans, and camper vans can also book space here for a very affordable price. I suspect this place books up well in advance, so plan ahead if you want to stay here. Those with the financial means to do so can stay at the top of the peninsula in luxury accommodations at The Farm at Cape Kidnappers. Part of the Cape Kidnappers Station, this complex includes a lodge, cottages, dining rooms, a pool, and one of the world’s most spectacular golf courses in the midst of a working farm. The owners of The Farm area also the force behind the establishment and maintenance of the peninsula’s reserve, so staying here supports that work. The nearest hotels are in Napier or, slightly farther still, in Hastings. We stayed in Napier, which was an easy drive down even for an early morning tour. Check TripAdvisor for reviews, prices, and availability. (Affiliate link) TripAdvisor also lists a couple of cottages and vacation homes in Te Awanga. I loved my own visit years ago to the Cape Kidnappers gannet colony in New Zealand. However, ours was via a simple van–I’d much rather have done the tour you did via tractors! Yeah, it’s a great place no matter how you see it, but the tractor tours are really cool! Although I’ve visited NZ, I haven’t been to the Hawkes Bay area. It look stunning. The cliffs and rock formations are fascinating. I really liked Hawkes Bay. The coast is gorgeous and the wineries are set between the coast and the mountains. It’s lovely. But then, NZ offers a lot of eye candy! Thank you for the memories, I grew up near to here and visited often as a child.I remember taking my children back as we now live in Australia and this was the number one thing I wanted to do with them. They loved it as much as I did as a child. How fun to do this as a child! (And what a lovely place to grow up.) It’s really great that they have been able to continue doing this for so many years that parents can come back with their own children. I’m glad they had a great time – maybe some day they will be able to come back with their own children. Wonderful photos, Cindy. I’ve seen an equally large community of gannets in Newfoundland and found it so exciting! Would love to visit their cousins in New Zealand! Thanks, Doreen. We are kind of gannet geeks (they are such elegant looking birds). It’s been so long I don’t remember if I saw them when we were in Newfoundland. . . I guess that means it is time to go back! You’re from Minneapolis? Love the look at the geology and beaches as well as the impressive gannet colonies. New Zealand is still on our list…. My husband is. I’m originally from central Minnesota, but I’ve lived in St Paul since I graduated from college. Lots to see in New Zealand, but it is very far away. It’s been on my husband’s list for years, so thought it was finally time to make it happen! Such a defined time to do that hike, it must be exhilarating. Sounds like a great experience. It’s really a blast, and, as a photographer I got lucky in that we started off fairly early in the morning. 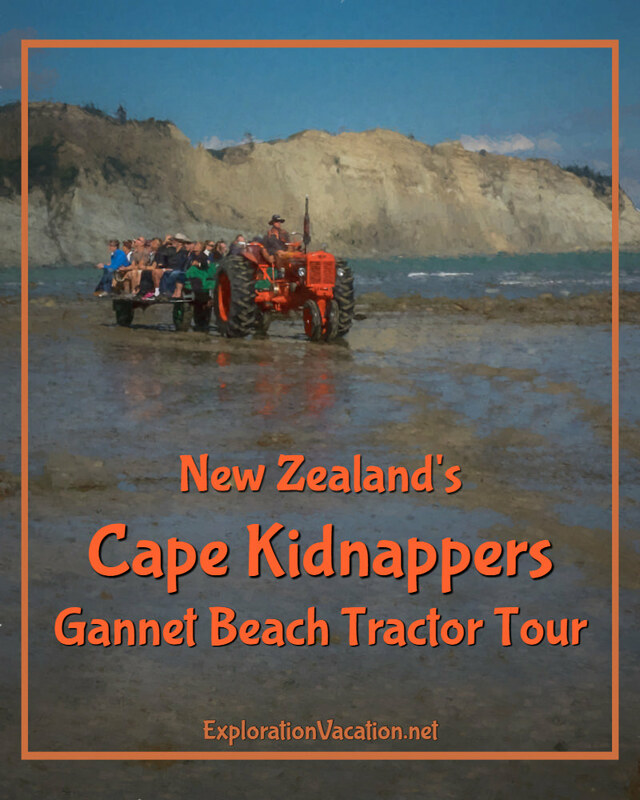 New Zealand’s Cape Kidnappers tractor tour looks like so much fun! Those craggy cliffs, and that turquoise water…just gorgeous! I want to go now! Thanks, Patti. That’s one of the advantages of the tractor tours (or hiking) – you get to enjoy the scenery! It really is a gorgeous spot.